Lately Jared, creator of the Writer's Outlet app (an app I truly love) is thinking about taking down the app and the group. He has his reasons, and as much as it annoys the hell out of me I get it. But I'll do what I can to help it stay. Writer's Outlet was the place I turned to when the place I guest blogged, poured my heart and soul on was taken down. I spoke to Jared about it from time to time asking what I can do to help because we can save it. He always gives us time because he knows we love the app. He always tells us to also give himself time to reevaluate the app, the group, and everything. Reading Zee Zulu's post on it helped me fully understand what was going on. I agree with Zee on a lot. It's not hard to talk about the Writer's Outlet. It's not hard to stay as a community. But with how life is there's not always something I see as share worthy. I've felt this way for a long time. I'm in quite a few writing communities where I used to be more active, but lately I'm focused on my own community and work. I tell all my friends about how much I love the app and how helpful people are. But since I could do more... I want to share some writing profiles from Writer's Outlet. Jared is one of the most compassionate and helpful leader's I know. He created two apps though I only go on Writer's Outlet. If you have a question he'll always answer. He shares all writer's works on multiple platforms. Anthony is one of the other hardest workers I've seen on the app. He's always there to answer questions. He also created a magazine with Jared for the community. He puts it all together, but I know Jared and him work together. While doing my research for this post I found a powerful poem by another top writer: [Insert Help Here] by Kay Writes. She posted quite a few things while I was doing my research. I can see why she's a top writer. No Fame No Name by Jordan Davis: I got to be an alpha reader to this story, and I absolutely love it. Another thing I started thinking about how a lot of people sometimes write and post only for clicks and stuff. I heard about this during an all day Writing Conference I recently attended. The advice was write for yourself. I talk to a lot of people who want to write what sells even if they don't particularly like what they're writing. Trust me when I say there's a market for EVERYTHING, so don't stress if you're a writer. I've always written for myself, and some people like what I write, so I know there's a market. I literally only wrote one story to please someone, and when my dad found out he sat me down and asked me why I was writing the piece. 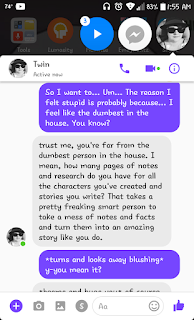 When I told him to please someone he said that I should never write to please others. I stopped writing it immediately because it wasn't fun for me. But at the same time I became an author because friends and family wanted to read my stuff, and we're all over the U.S. I write because I like to. I don't like putting unneeded pressure on myself. I'm in a good place in life, and writing has become a little more than a hobby. I have a few Facebook pages where I write what I like, and even if it doesn't get the most traffic I want to post it. Posting for my characters helps me get to know them more. People, including Facebook, have advised me to pay attention to the views and the numbers, but that would really stress me out. I love writing what makes me feel comfortable and what makes me feel uncomfortable.